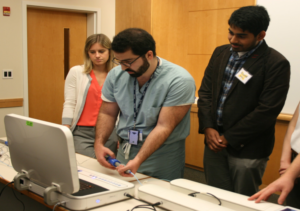 The Michigan Department of Radiology hosted its first medical student IR Symposium on August 13, 2016 at the Samuel and Jean Frankel Cardiovascular Center, thanks to the coordinated efforts of faculty, residents, and medical students. A total of 76 medical students representing over 15 regional, national and even international medical schools attended the symposium. Attendees had the opportunity to network with IR physicians and learn about IR through a diverse assortment of lectures and hands-on sessions. Exposure to IR during medical school is limited. Consequently, few medical students understand the scope of IR practice and the various ways in which IR physicians participate in patient care. In order to educate medical students about the specialty of IR, the department organized a diverse series of 15-minute talks for the symposium. Opening presentations, including a Welcome from the Chairman Dr. Reed Dunnick and Dr. Wael Saad, IR Division Director, documented the innovative history of IR and the University of Michigan. Next, ten case-based lectures highlighted the breadth of diseases and medical conditions treated by IR physicians within the University of Michigan Health System. 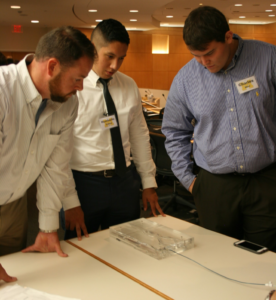 In addition to a variety of case-based talks, the symposium included time for attendees to network and learn about IR Residency training, including alternative pathways. Drs. Minhaj Khaja & Janet Bailey, Program Directors for Michigan’s IR Residency program, spoke about the evolution of IR training and the curriculum for Michigan’s IR Residency. Additionally, current IR residents answered student questions and provided insights for being a competitive applicant when applying to IR Residency. Following the lectures and Q&A sessions, attendees had the opportunity to participate in several hands-on workshops. 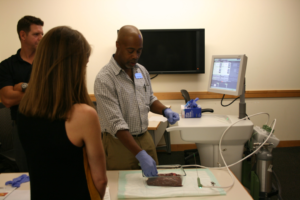 The workshops included observation and handling of catheters, stents, and IVC filters. Students were intrigued by the variety of materials used to make stents and questioned why one type of stent would be preferred to another. 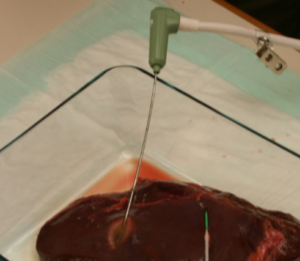 Furthermore, ultrasound biopsy models and aortic stent-graft simulators enabled students to practice IR techniques with guidance from IR residents and faculty. In addition, attendees had the option of touring the IR clinics and vascular and interventional angiography suites. 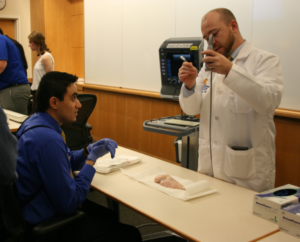 The Michigan IR team was pleased with the turnout of its inaugural Medical Student Symposium. The Department plans to continue the Medical Student Symposium annually and may consider coordinating a national event in the future. We would love to collaborate with other institutions who have also coordinated IR Symposiums as we move forward.